We have collected 10 Amazing Facts about Android which most of the Android users Do not know about Google’s Massive operating system. Android is growing day by day and currently it is the mostly using operating system. android has so many features which attract users towards it, in comparison to the other operating systems android gives the users many reasons for using it instead of others. many users loves android for its millions of great applications, many uses android for its incredible customizations, and many loves it for developing awesome applications. All the android users loves it, but still they don’t know many amazing facts about this massive operating system which makes it to dominate the smart phones market. 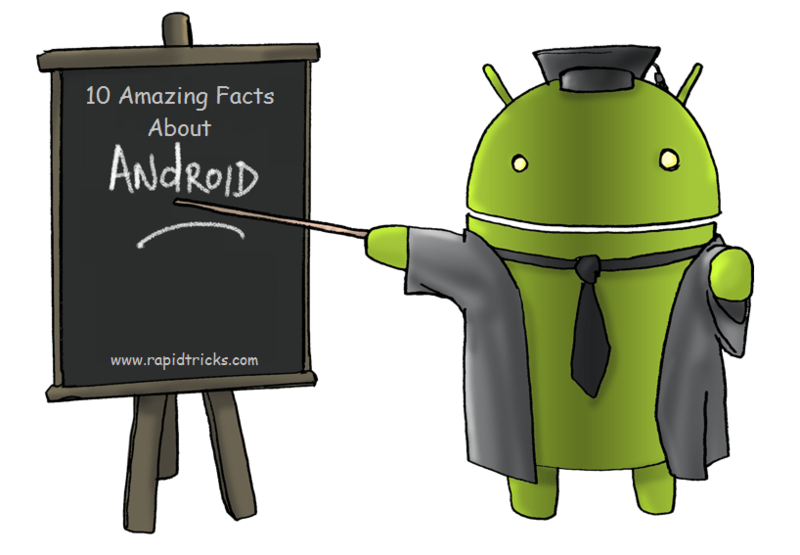 So today we have brought to you “10 amazing facts about Android” which most of android users did not know. Yes you read it write, Android is not founded by google. Android was founded by Andy Rubin, Rich Miner, Nick Sear and Chris White in October 2003 in Palo Alto, California. Later in 2005 google inc. acquired Android operating system for $50 Million. after acquisition of android by google, rumor began to circulate that google was planing to enter in mobile phone market with this move. the rumors has changed in reality and google marketed the platform to the handset makers and promised to provide a flexible upgradeable system. Google has launched the operating system in November 2007. the operating system has initially been developed for cameras, but google saw potential for using the OS for smart phones, and worked on a lot more features for it. after doing all the mandatory task to make it compatible for smart phones. The early intentions of google was to develop advance operating system for digital cameras. later google realize that the market for the digital cameras has not large enough to use this advance operating system only for digital cameras. so google decided to producing a smart phone operating system that would rival Symbian and Microsoft windows mobiles. The first android operating system based smart phone was HTC’s Dream, HTC has launched the smart phone in 2008. HTC used the android version 1.0 in their first android smart phone “Dream”,later the operating system was upgraded to the 1.6 version due to experiencing some lacking in functionality. Overall the operating system was considered to be innovative. Google CEO sunder pichai has announced that the android has over 1 billion users worldwide in more than 190 countries worldwide, which makes it the largest smart phone operating system. Android users are growing day by day, every new day more and more people are turning to android making it the most powerful operating system so far. Google offers android system to mobile phone manufacturers without any payment for its license. it helps android to attract more smart phone’s manufacturers and also android developer. Despite offering android to smart phone manufacturers without any payment of license, android still makes a huge amount of money by advertising on google. google is always advertising king and it continues its kingdom by implementing advertise on smart phones, tablets and other android based devices. Apart from 1.0 and 1.1 all the other android version have been named and all the names are chosen alphabetically . Android version follows alphabetic order in their naming, lets see the naming order. F for Froyo – 2.2..
G for Gingerbread – 2.3..
H for Honeycomb – 3.. I for Ice Cream Sandwich – 4.0..
Android has allow users to modify the source code, Android was built from the ground up to enable developers to create mobile applications that take full advantage of specification that a handset has to offer. android offers great flexibility to the developers and smart manufacturers in adding features to the operating system. How did you like these Amazing facts about android? Tell us in comments box and don’t Forget to like and Share because “Sharing is Caring”.